Becky Villareal was born in Dallas, Texas in 1954 to Missionary parents who traveled throughout the Southwest. Through her experiences as a child, she has learned the benefit of being multicultural in a diverse society. She loves working on her family history and incorporating her experiences into her writing. The Broken Branches is a coming of age novella for young adults written by Becky Lee Villareal. Sarafina had big dreams. She loved to write, and Ms. Olivares seemed to think she could be a great writer with the proper education and training. Sarafina wanted this future so very badly. She wanted to be able to take care of her mom who had struggled to support her and her abuela. When Ms. Olivares introduced the genealogy project and suggested that it would be a good addition to her portfolio for admission to the Towngate Magnet School, Sarafina was determined to finally persuade her mom to tell her about her dad and his family. She knew and loved the stories her mom had told her about the Garcia family and their ancestor who had been a Viceroy and then a President, but whenever she asked about her father, her mother would only say that he was dead. Becky Lee Villareal’s coming of age novella for young adults, The Broken Branches, is a beautifully written and moving story about a young woman’s search for her identity. I was transfixed as Sarafina slowly and carefully recovers the broken branches of her family tree in her research for a school project that takes on a much deeper dimension for her and her mom. I loved following her genealogical research and seeing how her and her mom interact with Nicole, a former classmate, who helps Sarafina see her home and straitened circumstances through different eyes. Becky Lee Villareal’s characters are compelling and credible, and her plot works quite well. The Broken Branches is most highly recommended. Growing up is hard. Growing up without one parent is even harder. 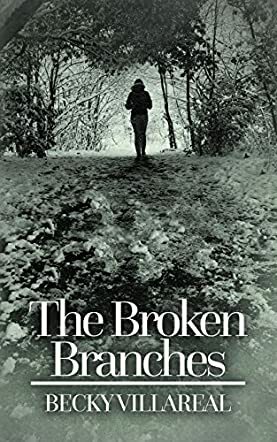 In The Broken Branches, written by Becky Lee Villareal, Sarafina Garcia, a young Hispanic girl, desperately wants to go to Towngate Magnet School to learn the craft of writing and to become a journalist and a writer, so that she can take care of her mother someday. One day, Sarafina gets a school assignment to find out more about the history of her family. Kept in the dark by her mother and late grandmother about who her father was, as well as the past on her grandmother's side of the family, Sarafina decides to find out the truth that her mother has been hiding from her all these years by any means necessary. Together with her friend, Nicole, who recently suffered the loss of her father and ended up living on the streets for a while after his death, Sarafina seeks help from local librarians and researchers, and attends a genealogy conference in town to consult experts in the field to hopefully find out the truth about her family. The Broken Branches tells a story about three generations of strong women, how they dealt with hardships in their lives and survived. It is an inspirational story about family, friendship, love and identity that gives the reader an insight into the mind of a young ambitious girl with a big heart and a beautiful mind. A very eloquent, touching and emotional account of a life in the making; the life of a young girl who tries to find herself through researching her family's past and secrets while at the same time struggling with the issues of growing up.